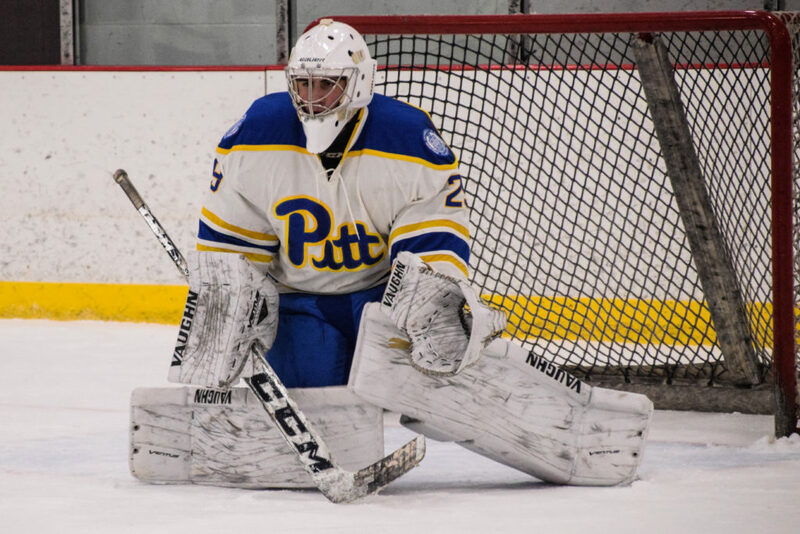 HARMAR Twp., Pa — The Pitt Panthers hosted non-conference foe West Chester for a weekend series at Alpha Ice Complex, earning a split with a 5-1 Saturday victory after falling in overtime Friday night, 3-2. The Panthers had entered the weekend on a three game losing streak, having been swept by No. 21 Rhode Island and losing to No. 5 Ohio. West Chester, meanwhile, entered the weekend with a record of 14-4-1 for third place in the Eastern College Hockey Association behind Drexel and the United States Naval Academy. On Friday night, it looked to be all West Chester, as the Ram’s defense built a brick wall on their own blue line. Every attempt by the Panthers to get the puck into the offensive zone resulted in turnovers and lost pucks. West Chester never wavered on offense either, peppering Pitt goaltender Matt Snader with shot after shot. Nothing found the back of the net until the Rams broke the scoreless tie 18:38 into the first period. Less than a minute later, though, Milo Defay put Pitt on the board with his ninth goal of the season. The second period was as even as hockey gets, with niether club finding the back of the net. Pitt closed the gap in shots on goal, only being outshot 22-20 by the end of the period. West Chester broke the tie just 30 seconds into the third period and looked like they would cruise through the period to victory. The physical play increased, but the clean game continued. At the midway point of the period, Jacob Tepe tied the game again for the Panthers and Pitt’s defense held strong to force overtime. Unfortunately, the Rams took advantage of the opportunity before the Panthers did and scored just 46 seconds into the extra period. While the Friday night game only featured four penalties (two apiece for the Panthers and Golden Rams), Saturday’s game was remarkably more physical. The amount of penalties was exceeded just in the first period alone, which included a brief skirmish between Max Milan of the Panthers and West Chester goaltender John Kelly. Each got called for a minor roughing penalty, with Danny Hargadon serving it in place of the Rams goaltender. The physicality prevented both teams from getting into any offensive rhythm. The first period ended with a scoreless draw as both teams headed to the locker room beaten and bruised with two-thirds of the game remaining. Just before the midway point of the second period, two quick goals by the Panthers gave them a 2-0 lead, including Jacob Tepe’s second goal of the weekend. Just over a minute later, Jonathan Fair extended the lead to three and the Panthers went to the locker room much happier than the first intermission. Tyler Skomsky added a goal 3:15 into the third to make it 4-0 Panthers and Pitt added the empty net goal after conceding one goal to West Chester to take the 5-1 victory for the well-earned weekend split. The CHMA standings feature three sets of ties and a close race for the #1 seed in the playoffs. IUP currently holds a game in hand over Duquesne and the two point lead over the Dukes in the standings. Duquesne holds the tiebreaker over Slippery Rock due to strength of victory. Pitt holds the head-to-head tiebreaker over Robert Morris with the two to meet again. The same scenario goes for John Carroll and Mercyhurst, as the Blue Streaks went into enemy territory and beat the Lakers on Sunday, 6-4. John Carroll took the sixth seed in the playoffs away from Mercyhurst with the victory, with the two to meet again to end the regular season on February 23. West Virginia remains winless in conference play, but has only played half of their allotted conference games so far. IUP can be the first to clinch a playoff spot with a win over Robert Morris and losses by John Carroll and West Virginia.